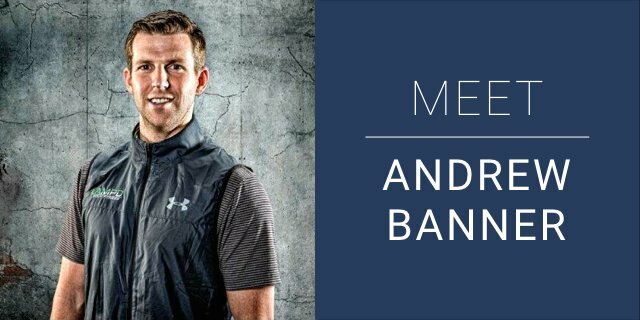 Andrew Banner is a certified personal trainer, corrective exercise specialist, performance enhancement specialist, and the Vice President and Director of Operations of AMPD Golf Performance (formerly AMPD Golf Fitness). Through AMPD’s daily training process, they stay true to their name, which means: Assess + Move + Perform = Dynamic Athlete. They use data and research based on physiological recovery and biomechanics to provide innovative training, which helps their clients achieve and maintain “dynamic athlete” status. In fact, they were featured in “The 50 Best Golf-Fitness Professionals in America” by Golf Digest! Since AMPD trains golfers of all levels, there’s a chance you’ll find professional golfer Jordan Spieth kettlebell training near a junior player doing a single-leg balance reach. But this facility doesn’t stop with golfers. You’ll find runners, tennis players, and other athletes getting AMPD, too. You’ll also find Andrew there ready to assist and encourage. Check out my interview with him. Andrew, Let’s Get Started With Your . . .
What’s your athletic background? How did you get into the golf training world and help establish AMPD? I played basketball and golf competitively through high school. As I was coaching basketball and golf at Clarion University while in graduate school for my MBA, I was in charge of training the teams in the weight room. I had a passion for it and wanted to learn more. Then I did some research and came upon Damon Goddard in Dallas. He was working with some professional golfers, and I figured he would be a good resource to learn from. He had me intern, and the rest is history. What all does AMPD offer? AMPD is designed to help golfers feel better and play better through improving swing efficiency. Like with our golf athletes, our system applies to anyone, so we work with all types of athletes, including general health clients. We provide training solutions in person and online. All solutions begin with our assessment process to ensure we are most efficient in providing results to our clients. Tell me how your company uses innovation and technology to train golfers. There is so much information available in the biomechanics of human movement and golf swing biomechanics, as well as golf ball analytics. We use this type of data to help us be more efficient and effective with our program design. With the evolution of technology in this space, we continue to gain accessibility to more KPI’s (key performance indicators), which make our job easier to track and monitor progress. Describe your approach to motivating athletes. How do you help them crush their performance goals? The beautiful thing about working with passionate athletes is that most of our athletes are self-motivated. Otherwise, they would not come to see us. So in that sense, we are very fortunate. However, with the help of all the data we collect, we are constantly able to identify areas of weakness, and our athletes will do anything to improve upon those weaknesses. The most challenging part of my work is seeing athletes who give it their all fall short of their expectations. I want them all to succeed, and that is what motivates me every day. The most rewarding part of the job is what I call “emotional income” — helping my athletes achieve their goals while helping them stay focused on their why. What business skills have you developed since AMPD began? My organizational skills have significantly increased since day one. When you start from the ground floor, there is so much to be done and no processes in place. Therefore, I have had to create most of them on the fly. Identifying inefficiencies and providing solutions is the skill set that has developed the most in my time with AMPD. How did your team learn about Exercise.com? Three years ago, I knew we had a global audience and needed a solution to reach them. I did some Google research, and Exercise.com was the company that provided the best services for our needs. We have athletes that can only see us every so often because they travel for tournaments or business. With that said, the online training platform has helped us provide better coaching solutions when our athletes are not with us. Now, we can continue to make progress when the athlete is on the road, and we can track their workouts. Who do you look up to in the pro golf world? I look up to the guys grinding away on the mini-tours doing everything in their power to earn their way to the PGA Tour. At AMPD, I get to work with a lot of these mini-tour golfers, and the ones who have the best chance to climb to the PGA Tour take every aspect of their performance seriously, which I have the utmost respect for. What go-to snack helps you refuel? Trail mix without the sweets. Nuts, raisins, dates . . . keep it simple. What’s on the horizon for AMPD? In 2018, we will roll out our services to private clubs across the country. We just had our grand opening at Dallas National Golf Club, and there will be many more in 2018.